For Liberal Democrats and remain supporters, this week brought an early Christmas present; victory in the Richmond Park parliamentary by-election. Toppling the incumbent, Zac Goldsmith, who was standing as an independent candidate after resigning from the Conservative Party over the government’s plans to expand Heathrow airport, the Liberal Democrats’ Sarah Olney won with 48% of the vote share and crippled Goldsmith’s former 25000 majority. Adding one more MP to the Lib Dem’s ranks will always be a welcome thing; winning an election off the back off our party’s absolute dedication and commitment to the EU is something that should not go unnoticed. Yes, one parliamentary by-election isn’t going to change the course of British politics overnight. Jacob Rees-Mogg was quite right to say that in his interview the day after the election result. This result is about the wider implications. Let’s put things into perspective: Zac Goldsmith won the Richmond Park constituency in 2015 with a majority of over 20000. The by-election was fought, on his part, on the issue of Heathrow and on the Lib Dem’s part, on Brexit. Goldsmith had the backing of both the Conservatives and UKIP; the Liberal Democrats had the support of the Green Party and a couple of the initial independent candidates. The Liberal Democrats’ current party policy is to block the triggering of Article 50 unless a commitment is made by the government to hold a referendum on the terms of the UK’s exit from the EU. That was the policy that was put to the people of Richmond Park. That was the policy that people voted for and that was the policy that returned our ninth MP, crippling Goldsmith’s majority and his political career along with it. Now many commentators and political analysts are saying that a pro-EU candidate winning in a pro-EU constituency is no big surprise. Well, no. It isn’t. But according to Lib Dem statistics, which, happened to be the most accurate on polling day, revealed that 33% of Conservative voting leave supporters, voted for Sarah Olney last Thursday. What this shows is that even those in favour of leaving the European Union are not in favour of the government’s current “direction” or “plan”. (I write in inverted commas because let’s face it, there is no direction or plan). Our party’s promise to hold a referendum on the terms of the deal of our exit from the EU is appealing not only to remain supports, but those on the side of leave. It’s only right that a process that started with democracy, end with democracy. Nobody who voted to leave the European Union knew exactly what our exit would look like…not one of them could tell anyone definitively. And that isn’t their fault! It is the fault of Cameron’s government to simply assume that his side were going to win and not putting something in place should they lose. The truth is, the current government led by Theresa May cannot justifiably seek a course of action that has not been mandated by her party, Parliament or the British people. The only action she can seek now is to leave the European Union. The process of how our country leaves the EU should be consultative; involving both Parliament and the people. 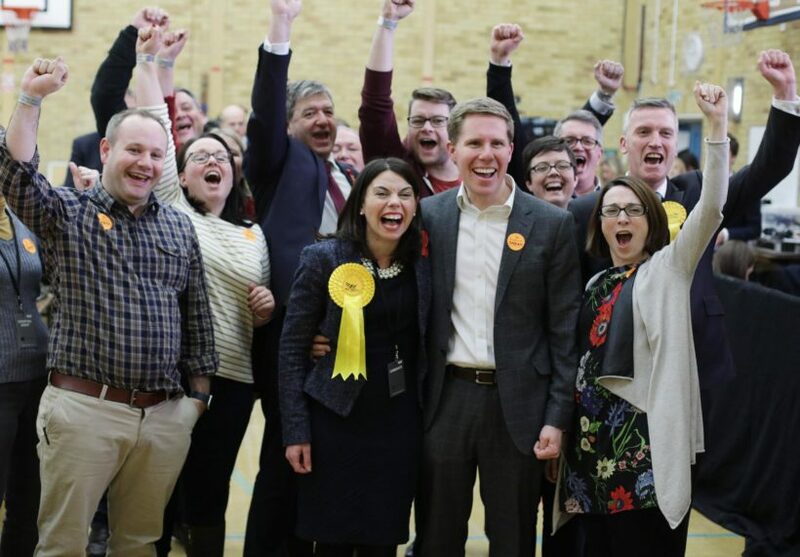 What Sarah Olney’s victory shows is a growing support for the Liberal Democrats’ vision for how Brexit should be conducted. This along with the countless gains we’ve made in council by-elections since the referendum in June shows, especially in areas that voted to leave, that people are turning to our party to provide the sensible, calculated and level-headed approach to leaving the European Union. Not to mention how we slashed the Conservative’s majority in David Cameron’s former seat by 20000 votes. We’re the party of the 100% – not just the 48% or the 52%. So no matter how small or insignificant you may think this by-election victory is; no matter how small or haul of MPs may still be, do not write it off. In the absence of a credible voice from the Labour Party and in the face of a confused and uncertain one from the Conservatives, the Liberal Democrats are providing direction during these difficult times. Richmond Park may have just been the start of something, and those authoritarians seeking to impose a hard Brexit should jolly well take heed.